This product is no longer available and has been replaced by: CR3000. The 21X Micrologger featured a self-contained package that had an integrated power supply, keyboard, and display. Its on-board power supply contained alkaline batteries. The 21X provided 8 differential (16 single-ended) analog input channels, 4 switched excitation outputs, 2 continuous analog outputs, 6 control ports, and 4 pulse counting channels. It had a CS I/O port that was labeled Serial I/O; an SC32A or SC32B was required for communications with a PC. The 21X stored up to 19,296 data points in its internal memory. Internal software PROMs (Firmware), ac rejection, and temperature testing were ordered at time of purchase. The 21X needed three PROMs for any Windows software to communicate with it. Two PROMs had only three *B windows; three PROMS had nine *B windows. For descriptions of PROMs, see Ordering Info. -NOTE- Note: Additional specifications are listed in the 21X Specifications Sheet. Memory Stores 19,296 data points in internal memory. When dialing up the 21X, the barometric pressure data is displayed in real time. When the data is collected via either dial-up or a storage module, the barometric data are all zeros. Why does this happen? It may be that there is no output flag set to dump data to final storage. It is possible that access is not being made to the right input location of the barometric pressure sensor to send it to final storage. To set an output flag, refer to the "Program Control Instructions" section in the 21X Micrologger Operator's Manual. What is the voltage output range for the 21X? The voltage ranges are software selectable for any channel, and full scale range is ±0 to 5 V. Refer to the "Input/Output Instructions" section for the input voltage ranges in the 21X Micrologger Operator's Manual. If the 21X was turned off before the data was downloaded using PC208W, what can be done? After the power to the 21X is turned off, the program, final storage data, and clock settings are lost. There is no battery-backup RAM or Clock in the 21X. 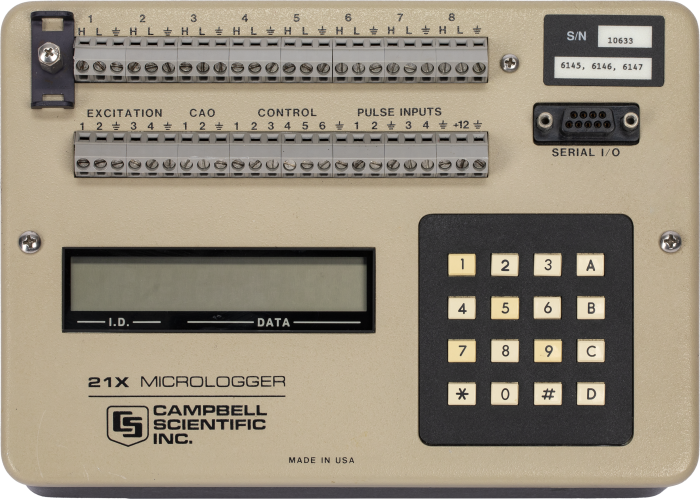 Do the 21X dataloggers have a built-in security code that might be activated under certain conditions when upgrading the program? Enter a security code using *C and a four-digit number. Enter a security code in Edlog. Under Options, enter a four-digit security code into the program. For more information on security, refer to Page 1-6 of the 21X Operator's Manual. What happens to a 21X program when the batteries fail? Whenever power is lost to the 21X, the program, clock, and final storage data are lost. Using our data logger support software, the program can be written and reloaded to the 21X. Campbell Scientific recommends keeping a backup to the program that includes a software and hard copy, as well as a backup wiring diagram of the sensors.